Bruce's inspiration for the 'accent' collection stems from the desire to create pieces that not only symbolize luxury and high quality, but also reflect the artistic process. 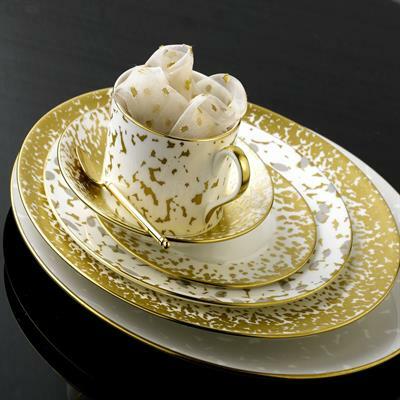 The dappled gold-leaf pattern around the edge of the plates is a playful take on the regal intricacy of Royal Crown Derby's signature pieces. Bruce has contrasted the design with a range of colours which are intended to flatter and add an element of fun to the modern dining table.